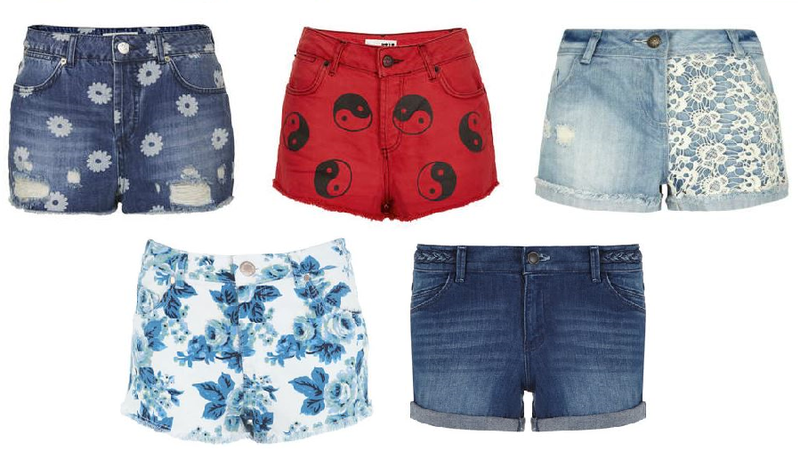 Shorts are a bit of a weakness for me; I have so many pairs. I wear them all year round with tights and in Summer I wear some pairs with no tights, but only the ones that don't have a risk of the dreaded 'cheek leak'! I've been browsing the internet for my pick of the best, so here we go! MOTO Daisy Ripped Hotpants- £30- Topshop- These are slightly high waisted and the daisy print makes them stand out a little more than your average denim shorts. They caught my eye as the daisies are so cute! MOTO Ying Yang Print Hotpants- £32- Topshop- When I saw these I knew they had to be included in this post, the colour is gorgeous and I love the ying yang prints! These would be good with black tights in winter too, with the deep red colour. Light Blue Wash Denim Crochet Leg Shorts- £22.99- New Look- Again these caught my eye as they are a little different take on your regular light wash denim shorts. The crochet panel is so on trend for Summer and I love the rugged turn up style! Blue Vintage Floral Shorts- £22 (was £32)- Miss Selfridge- How pretty is the print on these shorts? I love anything with a vintage look about it and these fit the bill. The contrast of the blue with the white is so beautiful too. Blue Plait Detail Denim Shorts- £22- Dorothy Perkins- The first thing that caught my eye on these shorts is the plait detail, so simple yet they really help to jazz up the shorts a little. Secondly, I like the length of them; these days it is hard to find shorts that aren't verging on being denim knickers, but the length of these is perfect for anyone a bit self conscious of the thigh region! So there you have it! What do you think to these picks? Today is my 22nd birthday and I'm off to the Trafford Centre for the day- I might treat myself to a pair of these!